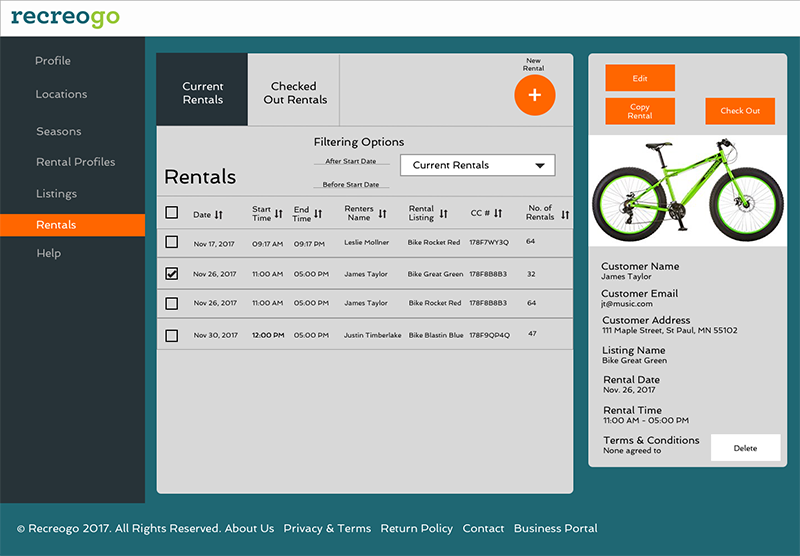 Recreogo provides a rental management and tracking system for recreational products like bikes, ATV’s, boats, jet skis, etc for businesses who rent out their products to consumers. The public facing view features various ways to search, compare products, and rent these products through the businesses who utilize Recreogo. Examine and evaluate the Recreogo website and business portal and make suggestions for the future design and development of the site. 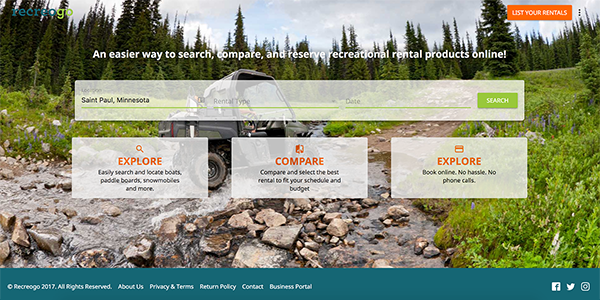 Recreogo users are hoping to find “an easier way to search, compare, and reserve recreational rental products online” from trusted businesses. From the start it was important to get a clear sense of how the Recreogo system works in general and more specifically, how consumer and business users utilize the site for their purposes. Gaining an understanding of these things would help with evaluation and analysis of the site and backend portal. The first step in the process was to work through a cognitive walkthrough. For this cognitive walkthrough, several main tasks for the Recreogo system were examined including processes for both consumer and business users. For consumers, finding and book rentals were important to using the system. 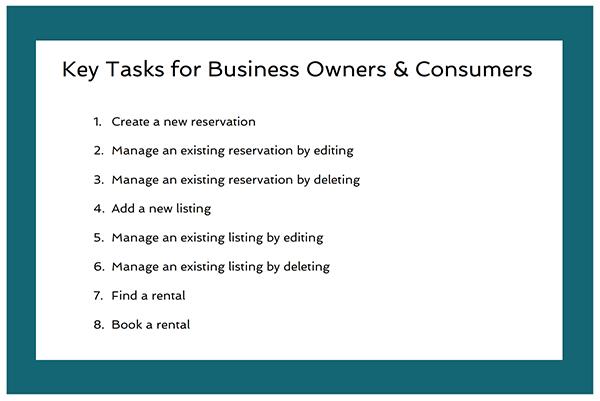 Key tasks for businesses using the internal portal included creating and managing listings of items to be rented as well as creating and managing new rental reservations. Evaluating all of these tasks was important in order to gain a basic understanding of how consumers and businesses use the Recreogo system currently. An in-depth interview with a business partner of Recreogo was the next step in the initial evaluation process. This contextual inquiry was powerful as it focused on an individual business and the needs and challenges this business faced when utilizing the Recreogo system. This research process provided insight about several important areas within the business portal that could be focused on in the later stages of this project. 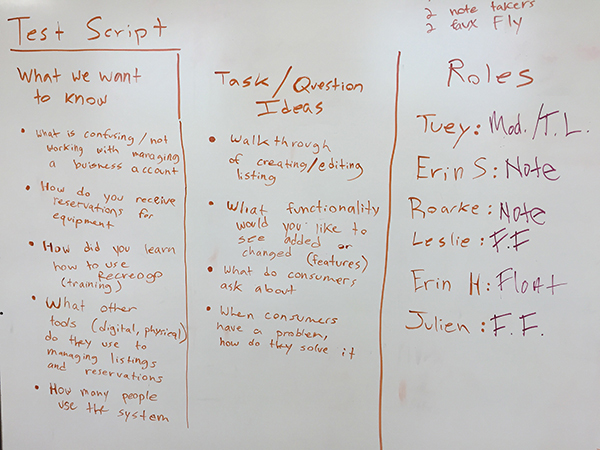 After completion of the cognitive walkthrough and the contextual inquiry, findings from both were examined and analyzed to create a plan for prototyping. A user research findings and plan document expressed improvements to user task flows and also listed possible enhancements in functionality. This documentation was important because it helped to organize the process of sifting through research and also provide a specific area of focus for the prototyping stage, the Rentals management area of the business portal. 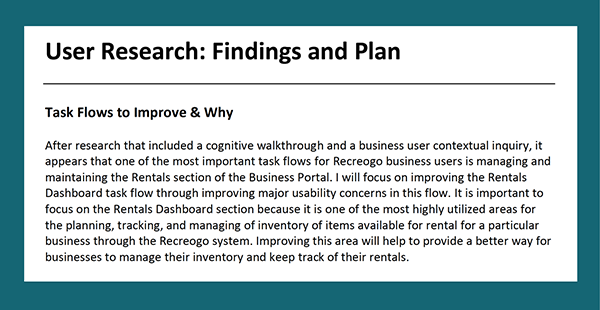 Usability concerns in the Rentals dashboard area of the business portal that were identified in the cognitive walkthrough and contextual inquiry related to issues such as clarity, visibility, readability, hierarchy, and functionality. Prototyping changes were aimed at fixing these usability concerns. It is clear that for business users, the system for keeping track of recreational equipment rentals is one of the main reasons for using Recreogo. Improvements in this area would allow business users to better manage their rental reservations and inventory and in turn, provide better service to customers who rent equipment through them. Better service to customers will impact the individual businesses by creating situations for more rentals in the future through Recreogo.